An unavoidable evil when living with other people is that belongings tend to be everywhere. I usually find a novel or two lying around on the floor, or even a pair of jeans hanging from the armrest of the couch. Living with children would be worse, entailing experiences at night where you’d walk around in the dark and suddenly swear out aloud because you’ve stepped on something painful – probably on a Lego piece or some action figure. You know that the clutter gets to be too much at the point where you would stuff everything in sight behind a closet door when a guest threatens to come over. I am reminded of old Looney Tunes episodes where Bugs Bunny and Daffy Duck would do the same with their belongings, only to have everything come crashing down along with the closet doors. 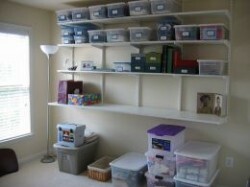 This is why Rubbermaid containers are perfect for living spaces teeming with clutter. With an overabundance of belongings to store and a lack of storage spaces to put them away in, I have found the only solution I will ever need. Rubbermaid bins are perfect for softer material such as clothes, stuffed toys, and other fabric-based objects. I have learned that cleverly folding them and stuffing them down would likewise save space in the Rubbermaid Storage Bins for more objects to store. Solid objects with definite shape prove to be trickier, although not impossible, to put away. The secret to storing hard objects in these plastic tubs would be to place them alongside other objects with similar contours to their bodies so as to minimize the amount of space between them and allot space for other objects. Books, for example, are the easiest objects to store because of their simple shapes and contours, while assorted toys for children would probably take the most effort and patience to stuff into Rubbermaid Storage bins. Rubbermaid Storage Bins are perfect for keeping collections because you don’t want to throw them away but you don’t want them scattered all over the house either. I have a huge DVD collection of movies from the 90’s and I was able to appreciate how Rubbermaid Storage Bins were able to store my entire DVD collection, including the DVD special edition cases that I hunted for so long in Amazon. The uniform shape of my DVD cases makes it easier to store and I merely stack them alongside each other to maximize the storage space. However, for objects with irregular shapes and sizes such as paperweights or snow globes, I use dividers to make sure each piece has a stable surface to stand on and at the same time protect it from scratching with other pieces. Dividers can be constructed out of illustration boards, available in your local bookstores or office supplies. After neatly storing your belongings in the plastic bin boxes, enjoy your clutter-free living space by putting away your Rubbermaid Storage Bins to store rooms like your closet, basement, or attic. Make sure, however, to label your plastic bins by putting an inventory of the stored items to know where to find what when need for it arises. As you can tell, Rubbermaid Storage Bins may not be advisable for storing objects you need easy and constant access to. If you’d use them in the regular course of your day, you’d be better off piling your belongings by your bedside. 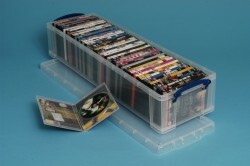 A plastic storage containers an unsightly storage space that should be kept behind the scenes or under wraps. There are decorative storage boxes or baskets available if you want such storage spaces in plain sight. 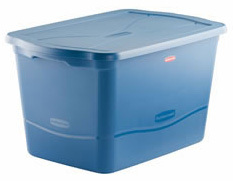 What do you think about Rubbermaid Storage Bins, or plastic storage boxes in general? Do you agree with the sentiments of my article? Leave a comment below to join in the discussion, and don’t forget to follow us on Twitter and like us on Facebook while you’re at it.